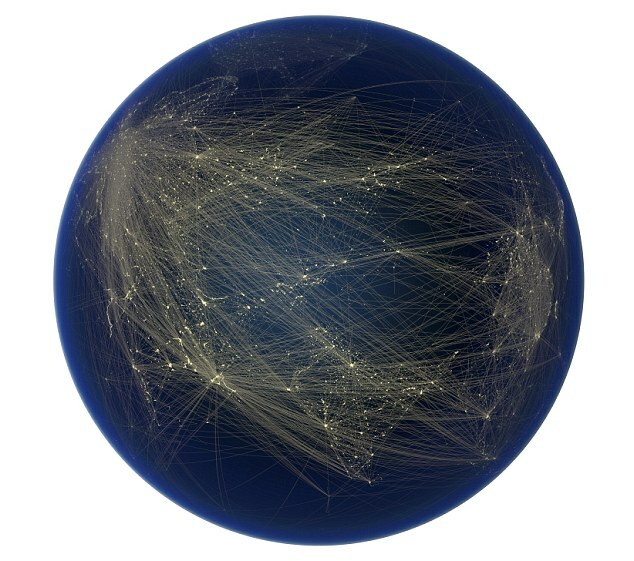 These silvery threads stretching around the dark globe create a dramatic spider's web showing the patterns of our global sprawl. 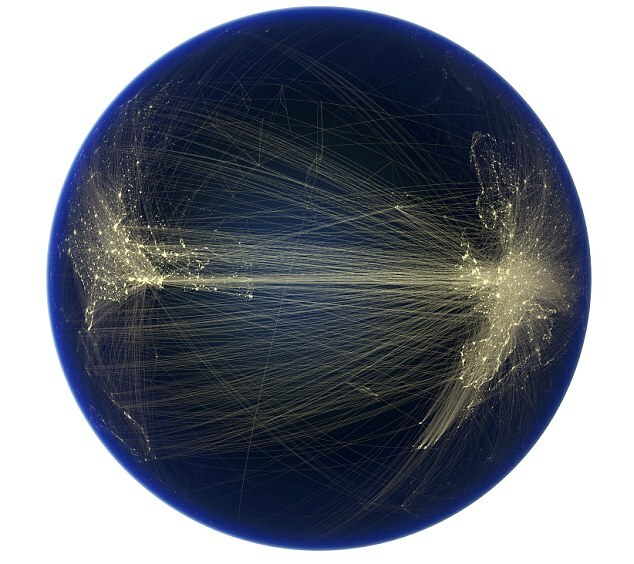 The stunning images are the result of 13 years of devotion by Canadian anthropologist Felix Pharand who uses them to show how human technologies such as data cables, aeroplanes and roads are colonising the surface of our planet. 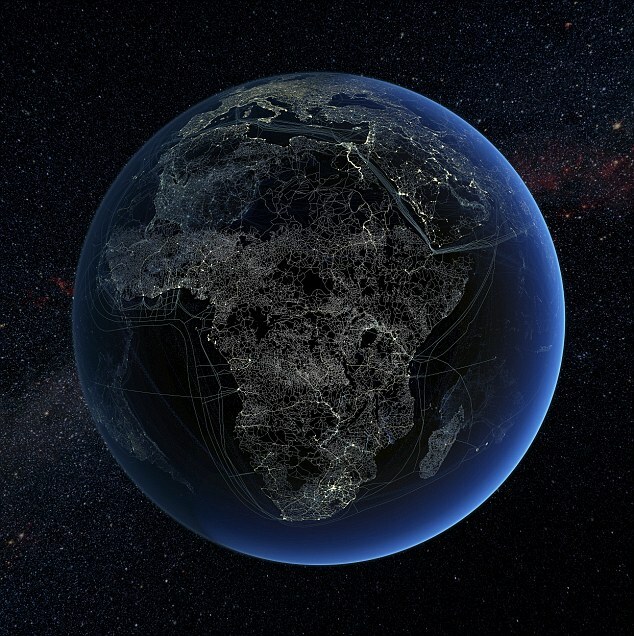 Using an ordinary home PC, Pharand input data from agencies such as the Geospatial Intelligence Agency and Atmospheric Administration to create accurate illustrations of how humans have 'domesticated' our planet - superimposing the data on images of the earth's cities lit up at night. 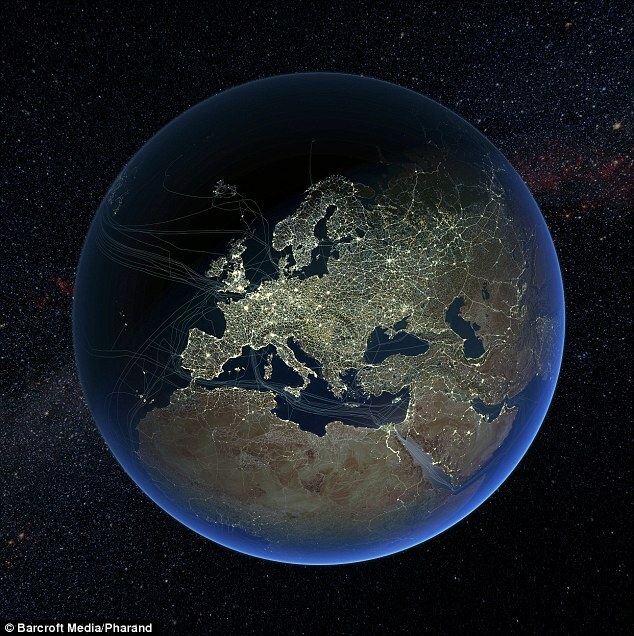 Pharand claims three per cent of the planet's land surface is under tarmac - an area the size of India. Earlier this week, the United Nations Populations Fund revealed that by October 31st, there will be an extra billion people on the Earth compared to 1999. According to the UN it has been estimated of all the humans ever born, over 6 per cent, are walking the Earth today. Felix taught himself design to communicate his ideas more effectively - and wanted to create the sort of visions of planets seen in sci-fi movies, but using real data from our world. 'I thought there would be huge strengths associated with global pictures depicting how far we've been at colonising, domesticating and transforming our home planet. I started to gather data from numerous sources and to explore ways of assembling them. We've seen similar pictures in movies like Star Wars, Contact, Avatar and the likes but I have never seen realistic renderings for our Earth. So I thought - why not try to make some? Felix is positive about the legacy of our species. 'Today's global civilisation is the work of billions of people throughout history,' he said, 'It has been established through much effort, successes and sufferings - as well as wars, inventions, exchanges, crisis and socio-technological changes. The world at the start of the 21st Century is also the result of what we call the Great Acceleration - the most rapid transformation of the human relationship with the natural world in history. 'Many human activities reached take-off points sometime in the mid-20th Century and sharply accelerated towards the end of the century. These shots are a tool to raise awareness - I think we have a duty to remain optimistic in our hearts,' says Pharand, a director of envivonmental group Globaia. By the end of the 21st century the world population could more than double to 15.8 billion people.